In order to support the application for the conversion of the existing office buildings to residential a desk study report was required to support the application. The review of the historical O.S. maps revealed that prior to the office buildings, the site was Worsted Mill with a gasometer on the western boundary. 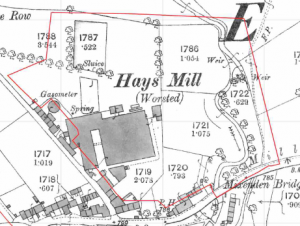 Subsequent maps reveal the expansion of the mill, the eventual demolition of the mill and erection of the office blocks and the partial in-filling of the reservoirs. Given the change of use to residential any soils imported onto the site during the development of the offices may be impacted by elevated levels of contamination and was regarded as a credible source of contamination. The qualitative assessment identified a number of credible potential sources of contamination on the site (gasometer, former mill, in-filled reservoir, made ground and imported topsoil) and the desk study proposed details intrusive works to determine the risks on the site. The desk study report can be accessed here, and confirmation that he recommendations of the desk study report were accepted can be accessed here.